I’m going to go out on a limb here and say that Brandon Anthony Gonzales got East Side 13 tattooed on his face as a way to represent his gang affiliation. It doesn’t seem like much of a stretch, considering that 13 is connotative of MS-13, the Mexican gang taking America by storm at the moment. 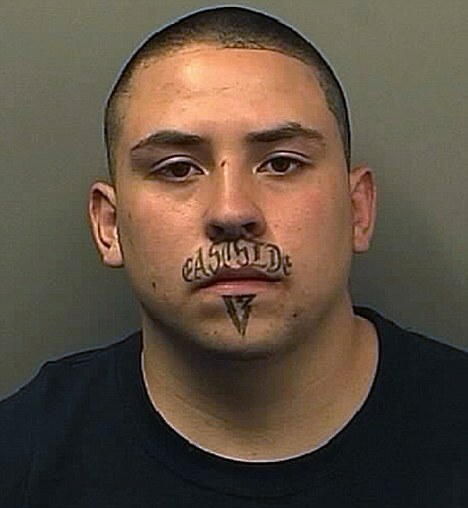 Either way, he’s living proof that getting facial tattoos is a bad idea if you want to live a life of crime, because his mustache tattoo lead to his arrest for a robbery. Brandon was one of several men to commit a home invasion in Pueblo, Colorado. Strangely enough, they were robbing an Elvis impersonator. Not sure why they’d rob him, but anyway, that’s who they robbed. Brandon wisely covered his face with a ski mask, but ski masks generally don’t also cover the mouth. Brandon’s most distinctive features, his goatee-tattoo hybrid, was visible the entire time. When police went around looking for suspects, they just had to bust the guy with a painted on word-mustache. That was probably an easy arrest to make.